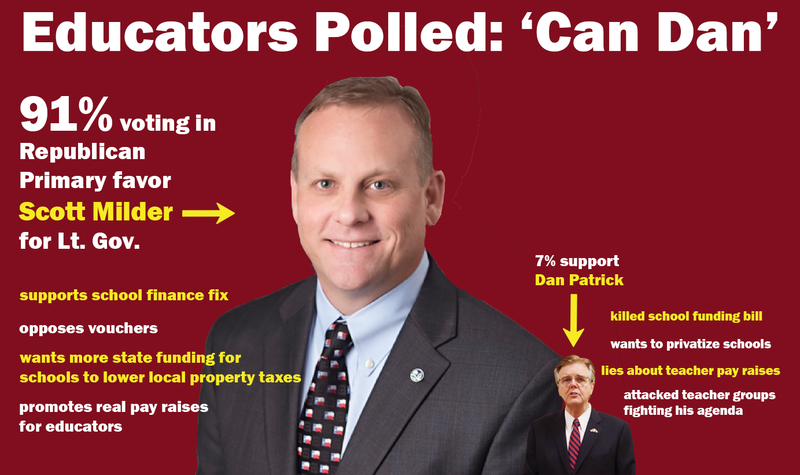 A Texas AFT poll of 1,863 Texans (74 percent of them teachers or other school employees) shows they favor Republican Scott Milder by a huge margin over incumbent Dan Patrick in the Republican primary race for lieutenant governor. Some 91 percent of respondents who indicated they were voting in the Republican primary said they planned to vote for Scott Milder, with just 7 percent favoring Dan Patrick, and 2 percent indicating “neither.” When all Democratic voters (and those uncertain of which primary they would vote in) were asked who they preferred in the Republican race, the results were even more lopsided—98 percent for Milder and just 2 percent for Patrick. 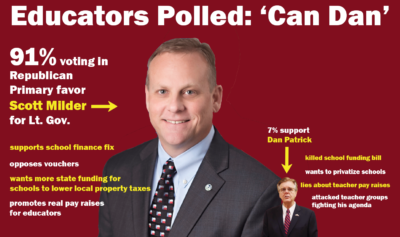 Malfaro added that Patrick also was directly responsible for killing a bipartisan school finance bill out of the Texas House that would have added significant funding to districts, held down increases in property taxes and provided more opportunities for districts to give teacher pay raises. Milder, who helped found Friends of Texas Public Schools, has made the foundation of his campaign true support of public education, including fixing the school finance system, so educators are solidly backing him. On the Democratic side, Mike Collier was favored 68 percent to 27 percent over Michael Cooper. Both candidates have pledged to support public education and oppose vouchers, with Collier specifically noting the need to fix shrinking state funding for education and the resulting rise in property taxes. Texas AFT has endorsed Scott Milder in the Republican primary and Mike Collier in the Democratic primary. To see all Texas AFT endorsements in the primaries, visit: https://www.texasaft.org/campaigns/primary-election-2018/. (Republican Primary voters) I plan to vote for..
(Democratic Primary voters) I plan to vote for..